Mitochondrial quality control is fundamental to all neurodegenerative diseases, including the most prominent ones, Alzheimer’s Disease and Parkinsonism. It is accomplished by mitochondrial network dynamics – continuous fission and fusion of mitochondria. Mitochondrial fission is facilitated by DRP1, while MFN1 and MFN2 on the mitochondrial outer membrane and OPA1 on the mitochondrial inner membrane are essential for mitochondrial fusion. Mitochondrial network dynamics are regulated in highly sophisticated ways by various different posttranslational modifications, such as phosphorylation, ubiquitination, and proteolytic processing of their key-proteins. By this, mitochondria process a wide range of different intracellular and extracellular parameters in order to adapt mitochondrial function to actual energetic and metabolic demands of the host cell, attenuate mitochondrial damage, recycle dysfunctional mitochondria via the mitochondrial autophagy pathway, or arrange for the recycling of the complete host cell by apoptosis. Most of the genes coding for proteins involved in this process have been associated with neurodegenerative diseases. Mutations in one of these genes are associated with a neurodegenerative disease that originally was described to affect retinal ganglion cells only. Since more and more evidence shows that other cell types are affected as well, we would like to discuss the pathology of dominant optic atrophy, which is caused by heterozygous sequence variants in OPA1, in the light of the current view on OPA1 protein function in mitochondrial quality control, in particular on its function in mitochondrial fusion and cytochrome C release. We think OPA1 is a good example to understand the molecular basis for mitochondrial network dynamics. Mitochondrial dynamics become more and more important since it is recognized that the morphology of this highly dynamic network is relevant for many pathological conditions, foremost neurodegeneration  but also stroke  and cancer [3, 4]. Mitochondrial network dynamics – continuous fission and fusion of mitochondria – mediates mitochondrial quality control (MQC) for the eukaryotic cell. MQC comprises more than one would initially associate with the term keeping mitochondria in “good health” by restoring or removing damaged organelles. But mitochondria are capable to process a wide range of different intracellular and extracellular parameters by mitochondrial network dynamics and they do this to accommodate cell homeostasis and cell fate by the following measures: a) Mitochondrial network morphology changes to either a more filamentous or more fragmented state to adapt mitochondrial function to actual energetic and metabolic demands of the host cell [5, 6]. b) Fusion of dysfunctional mitochondria to functional mitochondria can attenuate damage to mitochondrial proteins, lipids, and mtDNA . c) Inhibition of mitochondrial fusion targets single dysfunctional mitochondria to the mitochondrial autophagy pathway . And most importantly d) Mitochondrial fragmentation, mitochondrial outer membrane permeabilization, and cytochrome C release signals severely impaired host cells to undergo cell death . This mitochondrial ontology is referred to as MQC and it is mediated by mitochondrial network dynamics. The mitochondrial network is regulated in highly sophisticated ways by various different posttranslational modifications, such as phosphorylation, ubiquitination, and proteolytic processing of its key-proteins, which also reflects the wide range of different intracellular and extracellular parameters integrated into the MQC [1, 10, 11]. Mitochondrial fission is facilitated by DRP1 , while MFN1 and MFN2 on the mitochondrial outer membrane, and OPA1 on the mitochondrial inner membrane are essential for mitochondrial fusion . Mutations in most of the genes encoding MQC proteins have been associated with neurodegenerative diseases with tremendous effects on the whole organism (reviewed in  among others). Mutations in one of these genes, however, are associated with a neurodegenerative disease that originally was described to affect only the retinal ganglion cells, which connect the eye via the optic nerve to the brain. Though it is becoming more and more evident that other cell types are affected as well. In the following we would like to discuss the pathology of dominant optic atrophy (DOA; OMIM: #165500) caused by heterozygous sequence variants in op tic a trophy gene 1 (OPA1; OMIM: *605290) in the light of the function of OPA1 in MQC. We think OPA1 is a good example to understand the molecular basis for MQC – the decision process between cell maintenance, mitochondrial autophagy, and cell death. We would like to point out, as mentioned above, that this represents only one part of mitochondrial network regulation among many and that we are just at the beginning of unraveling the complexity of this newly emerging field of MCQ. Neuropathies of the nervus opticus severely impair vision. One can distinguish between acquired optic neuropathies, which are mostly caused by intoxications (e.g. methanol, cyanide, lead, chloramphenicol, ethambutol) or nutritional deficiency symptoms (e.g. Vitamin B), and hereditary optic neuropathies, which can be further subdivided into syndromic forms with associated extra-ocular symptoms or non-syndromic forms limited to the ocular phenotype . The two most common non-syndromic hereditary optic neuropathies are DOA with an estimated prevalence from 1:50 000 to 1:12 000 [13, 14] and Leber’s hereditary optic neuropathy (LHON; OMIM: #535000). DOA is also referred to as optic atrophy, Kjer type (OAK) or juvenile optic atrophy in older publications. DOA is associated with mutations in nuclear genes encoding mitochondrial proteins, primarily the OPA1 gene [15, 16], while LHON is associated with mutations in the remnant endosymbiotic genome, the mitochondrial DNA (mtDNA). Noteworthy, also acquired optic neuropathies involve mitochondrial impairments (cf. ). Glaucoma, the leading cause of worldwide blindness, is a non-syndromic optic neuropathy of the elderly and a complex disease associated with both environmental and genetic risk factors . Patients with DOA suffer from slow progressive course of painless bilateral visual function loss with onset typically within the first two decades of life. The symptoms are mild to severe decrease in visual acuity, color vision deficiency, and visual field defects [19, 20]. DOA is caused by loss of retinal ganglion cells only (RGCs) located in the inner retina and projecting their axons via the optic nerve to the brain. RGC loss and atrophy of the optic nerve are accompanied by thinning of the nerve fiber layer of the retina and the characteristic fundus with pallor of the optic disc [20, 21], which is the structure where the RGC axons exit the eye. RGCs are the only affected cells among the 60 different neuronal cell types found in the retina and although photoreceptors are the cells with the highest oxygen consumption in the retina, light perception and signal processing in the retina is not impaired but signal transmission from the eye to the brain is distorted (see  and references therein). The clinical presentation of DOA is heterogeneous. The ocular phenotype is variable and not all family-members that carry pathogenic mutations in DOA associated genes present visual impairments [19–21, 23–26]. The probability for mutation carriers to develop symptoms during lifetime has been estimated at 88% . On the other hand, heterozygous OPA1 mutations are associated with a broad range of extra-ocular symptoms, sometimes at the sub-clinical level. These symptoms include sensorineural deafness, ataxia, axonal sensory-motor polyneuropathy, chronic progressive external ophthalmoplegia, and mitochondrial myopathy [27–31]. Some studies therefore differentiate between non-syndromic and syndromic forms of DOA and suggest the later being associated with dominant-negative OPA1 mutations [30, 32]. However, one can observe the whole spectrum of disease manifestation from unaffected, to non-syndromic, to syndromic patients within one family segregating one single OPA1 mutation [28, 29]. This speaks more for a continuous clinical picture of DOA rather than a discrete one: different cell types are differently affected in different individuals with RGCs being mainly affected. The human OPA1 gene is composed of 30 coding exons (exon 1 to 28, exon 4b, exon 5b) distributed across more than 90 kb of genomic DNA on chromosome 3q28-q29. Alternative splicing of exons 4, 4b and 5b leads to eight isoforms with open reading frames for polypeptides of 924 to 1015 amino acids . The OPA1 proteins are classified as large GTPases of the dynamin family, which are imported into mitochondria by their amino-terminal import sequence, and which are necessary for mitochondrial inner membrane fusion. With almost 300 sequence variants that cover the whole locus, OPA1 is the most frequently mutated gene in DOA [34, 35]. Mutations in OPA1 account for at least 45% of all DOA cases and genomic rearrangements in the OPA1 locus account for not less than an additional 10% of DOA cases [23, 36]. OPA1 is ubiquitously expressed and well conserved from yeast to man, which underpins its fundamental biological role. Genetic mouse- and fly-models that carry homozygous OPA1 mutations show embryonic lethality [37, 38], but OPA1-null mouse embryonic fibroblasts can be cultured , which suggests an essential function of mitochondrial inner membrane fusion during development . Only very few patients carry confirmed compound heterozygous OPA1 mutations, a 30-year-old woman (p.[E270K];[R290W]), who suffers from a severe ocular manifestation of DOA , a 60-year-old man and his 64-year-old sister (p.[S256R];[Q285R]), who both show ataxia, myopathy, peripheral neuropathy, and spasticity in addition to optic atrophy , an 8-year-old boy and his 3-year-old sister (p.[I382M];[V903Gfs*3]), who show severe optic atrophy already at this young age and severe neurological impairments with hypotonia and ataxia , and a 4-year-old boy (p.[S64fs];[V377I]), who also shows severe ocular phenotype already at this young age . The OPA1 protein is associated with different functions, such as maintenance of the respiratory chain and membrane potential , cristae organization and control of apoptosis , as well as mitochondrial DNA maintenance [30, 31, 47]. And yet, all studies agree in the fact that OPA1 on the mitochondrial inner membrane, together with MFN1 and MFN2 on the mitochondrial outer membrane, is necessary for mitochondrial fusion and that this process is regulated by proteolytic cleavage of OPA1. Mitochondrial fusion in general requires both long OPA1 isoforms (OPA1L) and short OPA1 isoforms (OPA1S) , but the long OPA1L isoform alone is sufficient for stress-induced mitochondrial fusion . Many different proteases directly or indirectly lead to OPA1 processing [39, 49–54], among them are the matrix– and the intermembrane space ATPases associated with a number of cellular activities (m-AAA and i-AAA protease, respectively), the presenilin-associated rhomboid-like protease (PARL), the high temperature requirement A2 protease (HTRA2) and overlapping activity with m-AAA protease (OMA1), which all are associated with neurodegenerative diseases (reviewed in ). Of note, heterozygous mutations in s pastic p araplegia g ene 7 (SPG7; OMIM 602783), which codes for paraplegin, one of two monomers that assemble m-AAA proteases, have been identified in a four-generation family segregating non-syndromic DOA with no signs of spasticity, which is originally associated with mutations in SPG7. Our current understanding of OPA1 processing is that OPA1 is translated in the cytosol and subsequently imported into mitochondria, where it is processed by the mitochondrial processing peptidase, which cleaves off the amino-terminal import sequence after amino acid position 87 (NP_056375) . These long OPA1L isoforms are anchored to mitochondrial inner membrane and can be further processed at protease cleavage site S1 at amino acid position 195 (NP_056375) in exon 5, which results in short OPA1S isoforms devoid of the amino-terminal transmembrane domain . Decrease of mitochondrial membrane potential ΔΨm results in OPA1 processing by OMA1, which cleaves all splice-forms of OPA1L at S1 in a ΔΨm-dependent manner [53, 54]. OPA1 splice-forms 4, 6, 7, and 8 include exon 5b, which contains an additional protease cleavage site S2 at around amino acid positions 217–223 (NP_570849) [39, 51]. The mitochondrial i-AAA protease YME1L is necessary for proteolytic cleavage of OPA1L at S2 [39, 50], and therefore generates OPA1S only from a subset of OPA1L isoforms, which allows adjustment of mitochondrial fusion (i.e. the ratio between OPA1L and OPA1S) by gene regulation as well as protein processing . Knock-out of the mitochondrial inner membrane protein prohibitin by targeted deletion of the Phb2 gene leads to mitochondrial fragmentation and abnormal cristae structure. This involves ΔΨm–independent processing of OPA1L to OPA1S and can be rescued by expression of non-cleavable OPA1L . OPA1 is involved in mitochondrial fusion and cristae remodeling . Mitochondrial fusion and cristae remodeling are functionally distinct from each other and the later correlates with apoptotic cytochrome C release, which can be rescued by OPA1 overexpression . Initially, PARL was suggested to be involved in OPA1L processing, cristae remodeling and subsequent cytochrome C release . However, rhomboid proteases are not required for OPA1 processing  concealing the role of PARL in apoptosis (reviewed in ). Also the exact timing of cristae remodeling and cytochrome C release is still under debate (see  and references therein), as is the link between OPA1 and cristae junctions [46, 60, 61]. 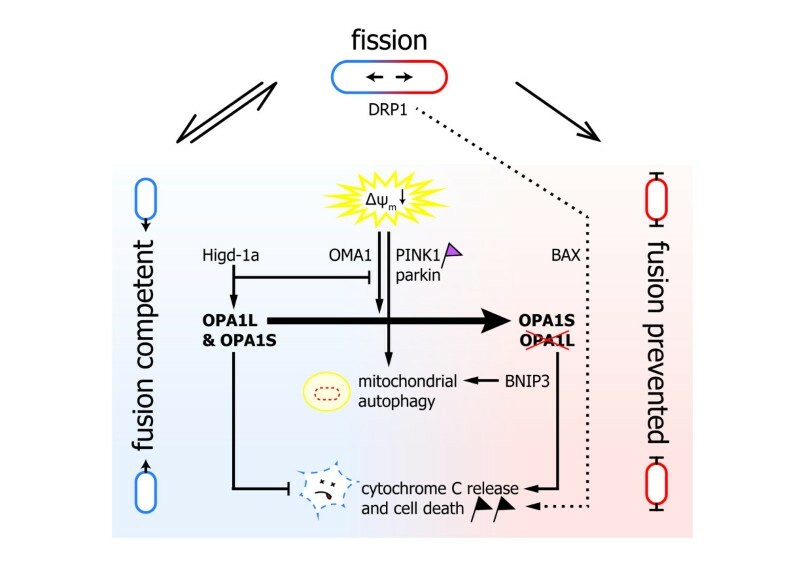 The only consent to date is that loss of OPA1 or inhibition of mitochondrial fusion by processing the entire pool of OPA1L and subsequent fragmentation of the mitochondrial network triggers cell death [39, 45, 50, 51, 53, 54, 56, 57]. Mitochondria are vulnerable to damage of their proteins, lipids, and mtDNA caused by various stress factors and mitochondrial fusion allows for exchange of mtDNA  and mitochondrial content between organelles in order to attenuate or complement this damage . In addition, mitochondrial fission and selective fusion is able to separate functional from dysfunctional mitochondria; single dysfunctional mitochondria are sorted out and degraded by mitochondrial autophagy (see Figure 1A). A study on pancreatic β cells has shown that mitochondrial fission generates uneven daughter units with respect to their membrane potential . Mitochondria with reduced membrane potential are prevented from re-fusing to the mitochondrial network by different mechanisms . One of these mechanisms is inhibition of mitochondrial fusion by ΔΨm-dependent proteolytic cleavage of OPA1L isoforms . Single mitochondria that don’t fuse anymore are subsequently targeted to mitochondrial autophagy and in line with this Opa1 mutant mice show increased autophagy in the optic nerve . Conversely, it has been shown that during starvation, mitochondria elongate and are spared from autophagy . Targeting of mitochondria with reduced membrane potential to autophagosomes is accomplished by the PINK1/Parkin pathway, which is associated with familial Parkinsonism . Together, these findings document that mitochondrial fusion, apart from its role in exchanging mtDNA and mitochondrial content, plays a fundamental role in maintenance of mitochondria. Basic role of mitochondrial network dynamics in cell maintenance termed mitochondrial quality control. Mitochondrial fission separates dysfunctional (red) from functional (blue) mitochondria. Refusion of dysfunctional mitochondria to the mitochondrial network is prevented and dysfunctional mitochondria are removed and recycled by mitochondrial autophagy (A). If a cell is stressed (yellow arrows in B and C), mitochondria fuse in order to protect themselves and to warrant that they are still functional (B). If the stress prevails, mitochondrial fusion is prevented, mitochondria fragment, and mitochondria signal their stressed host cell to undergo cell death thereby removing the whole cell from the organism (C). Mitochondrial network dynamics are regulated in highly sophisticated ways by various posttranslational modifications and proteolytic processing of the key-proteins DRP1, MFN1 and MFN2, and OPA1 [10, 11]. The carefully regulated balance of mitochondrial fusion and fission integrates not only the mitochondrial membrane potential, but also other mitochondrial, as well as intracellular and extracellular parameters, such as redox state, nutrition state, and toxicity load . Mitochondria can cope with these stress factors to certain extends by fusing mitochondria and forming very long connected tubular mitochondria (Figure 1B). However, if the stressors prevail and mitochondrial damage is too high, mitochondria signal the eukaryotic host cell to undergo cell death by mitochondrial fragmentation, mitochondrial outer membrane permeabilization, and cytochrome C release into the cytosol (Figure 1C). OPA1 is involved in mitochondrial fusion and cytochrome C release , which are functionally distinct , and therefore the capability of mitochondria to fuse their inner membrane and not fusion itself – in other words the fusion competent long isoform OPA1L – is crucial to counteract this cell death signal cascade . In line with this is the anti-apoptotic function of hypoxia-induced gene domain protein-1a (Higd-1a), which was shown to bind OPA1 and in doing so to prevent proteolytic cleavage of OPA1L to OPA1S, which in turn counteracted cytochrome C release [64, 65]. Of note, stress-induced mitochondrial hyperfusion also relies only on the long OPA1L isoforms . But still the molecular basis for the anti-apoptotic function of OPA1L is not fully resolved yet. Mitochondrial outer membrane permeabilization in order to release cytochrome C with subsequent cell death is facilitated by various mechanisms [9, 66–69]. Of note in this context is that cardiomyocytes from Opa1 mutant mice display delayed permeability transition pore opening under calcium stimulation and therefore a higher calcium retention capacity . This indicates that OPA1 – whether the fusion competent long OPA1L isoforms or the fusion incompetent short OPA1S isoforms is still open – might be involved directly in mitochondrial outer membrane permeabilization. Therefore OPA1 could have also a pro-cell death function besides its anti-apoptotic function described above. BNIP3, a mitochondrial pro-apoptotic BH3-only protein of the BCL2 family, is a direct interaction partner of OPA1 , which has been associated with an alternative mechanism of mitochondrial outer membrane permeabilization . This substantiates the pro-cell death function of OPA1(S). Figure 2 gives a simplified summary of the discussed MQC pathways and key-proteins with focus on the role of OPA1 processing. Principle of mitochondrial quality control with focus on OPA1 function and its contribution to mitochondrial network dynamics. DRP1 recruitment to mitochondria is necessary and sufficient for mitochondrial fission. In healthy mitochondria there is a continuous equilibrium between mitochondrial fission (top) and fusion (left side). Dysfunctional mitochondria can be repaired and rescued by re-fusion to the mitochondrial network (not depicted for the sake of clarity). OPA1L and OPA1S (together with MFN1/2 on the mitochondrial outer membrane) are necessary and sufficient for maintaining fusion competent mitochondria. Fusion is prevented in dysfunctional mitochondria by proteolytic cleavage of OPA1L to OPA1S (right side). The best-characterized example of dysfunctional mitochondria so far is dissipation of the mitochondrial membrane potential (ΔΨm), which leads to proteolytic cleavage of OPA1L by OMA1. OPA1 cleavage, however, occurs under various conditions enabling the integration of various parameters into mitochondrial network dynamics. Higd-1a, for example, regulates mitochondrial network dynamics by binding to OPA1L and thereby inhibiting its proteolytic cleavage. Dissipation of the mitochondrial membrane potential activates in the long run also the PINK1/parkin pathway (pink flag), which targets dysfunctional mitochondria for mitochondrial autophagy. OPA1L counteracts cytochrome C release and cell death (black flag) and therefore acts anti-apoptotic. OPA1S (presumably together with BNIP3) is necessary to promote cytochrome C release and cell death. This outer membrane permeabilization might be independent or happen in cooperation with BAX and DRP1 dependent outer membrane permeabilization (dotted line). BNIP3 is also necessary for mitochondrial autophagy and therefore could play an important role in the decision whether to remove single dysfunctional mitochondria or to recycle the whole cell by undergoing cell death. It seems rather complicated to understand mitochondrial network morphology and its significance to disease pathology. However, this relation might become clearer if one recalls that the eukaryotic cell can ultimately be understood only on the basis of its history. Mitochondria are descendants of a primary endosymbiosis almost 2 billion years ago. And although mitochondria have transferred almost their entire genome to the nucleus of their host, mitochondria have still preserved the power to break up the alliance with their host by signaling cell death, something we refer to as apoptosis. Mitochondria achieve this by releasing cytochrome C into the cytoplasm of their host and this strategy confers an evolutionary advantage to higher eukaryotes although, by doing so, mitochondria extinguish themselves together with their host. This becomes more plausible if one considers that mitochondria take many different intracellular and extracellular parameters into account before they decide to quit the liaison with their host. As long as mitochondria are happy, they continue to function normally supplying their host with various metabolites and energy. Once the mitochondrial environment – in other words the host cell – is inappropriate, mitochondria release cytochrome C and signal cell death. In addition, single dysfunctional or damaged mitochondria can be removed from the mitochondrial pool by mitochondrial autophagy without any harm for the host cell. This whole process is called MQC (though mitochondrial ontology would be more to the point). One model to explain the apparently contradictory finding of an anti-apoptotic as well as pro-cell death function of OPA1 is that OPA1S supports outer membrane permeabilization by generating membrane hemi-fusion intermediates between the mitochondrial inner– and outer membrane (Figure 3). This confers a pro-cell death function to OPA1 because hemi-fusion intermediates are energetically favorable for membrane permeabilization. Similar was suggested previously for hemi-fission states of mitochondrial outer membranes , or hemi-fusion intermediates of the mitochondrial outer membrane and the endoplasmatic reticulum  and it might depend on the cell type and the nature of stress factors which mechanism of mitochondrial outer membrane permeabilization dominates. The inner membrane bound OPA1L on the other hand binds the soluble OPA1S in order to enable mitochondrial inner membrane fusion, thereby preventing inner membrane and outer membrane hemi-fusion intermediates, which explains the anti-apoptotic function of OPA1L. The pro-cell death and anti-apoptotic contributions of OPA1 might differ between cell types and depend on the nature of the stress factor. One could speculate that for neuronal cells DRP1 and BAX are more relevant for outer membrane permeabilization, while in reperfusion of cardiomyocytes outer membrane permeabilization depends more on OPA1 and BNIP3. This model of various alternative mechanisms for outer membrane permeabilization can explain the broad range of cell death between the two extremes necrotic- and apoptotic cell death. Molecular model of the dual function of OPA1 in mitochondrial inner membrane (IM) fusion and cytochrome C release and cell death. Membrane bound OPA1L and soluble OPA1S form a complex that is able to attract two mitochondrial membranes to enable inner membrane fusion (left) and cristae organization. Proteolytic cleavage of OPA1L to the soluble OPA1S allows the formation of OPA1S complex, which together with BNIP3 promotes mitochondrial outer membrane (OM) permeabilization, cytochrome C release, and cell death (right) by bringing the mitochondrial inner membrane in proximity to the mitochondrial outer membrane, thereby facilitating membrane hemi-fusion states that are energetic favorable for membrane permeabilization. 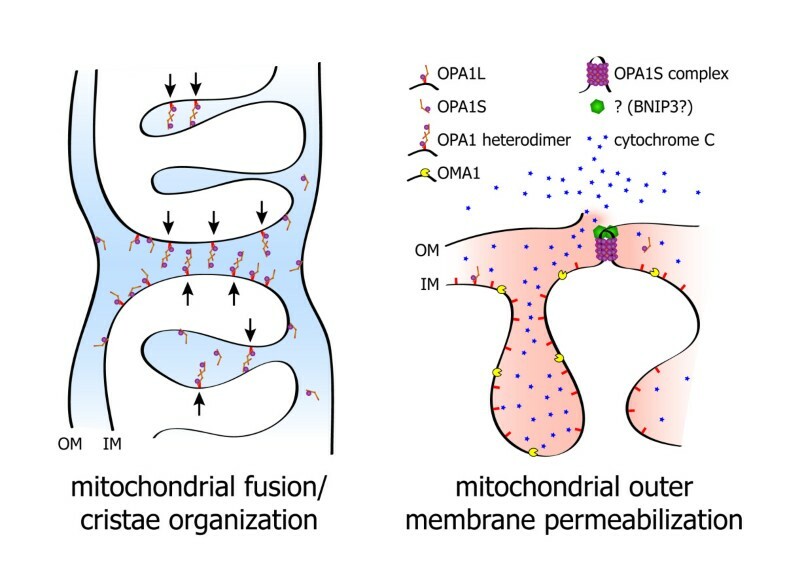 Mitochondrial fusion and fission integrates not only the mitochondrial membrane potential ΔΨm; OPA1L is processed under various stress conditions, such as redox state, nutrition state, and toxicity load. This implies that mitochondrial targeting to autophagy is not only accomplished by the ΔΨm dependent PINK1/parkin pathway, but also by other pathways. One such pathway could involve BNIP3, because BNIP3 interacts directly with the autophagy machinery  and is necessary for mitochondrial autophagy induced by hypoxia . Interestingly, BNIP3 is also highly expressed in neuronal models of excitotoxicity , which is a pathological incident that leads to neuronal cell death by excessive neurotransmitter stimulation, for example by stimulation of ionotropic glutamate receptors, such as NMDA receptors. Opa1 mutant mice show extensive mitochondrial fission in RGC axons of the optic nerve head and significantly increased NMDA receptor expression in the retina . On the other hand it was shown that excitotoxicity results in mitochondrial hyper-fragmentation by the activation of the DRP1 fission pathway . This shows that excitotoxicity can modify the mitochondrial network and vice versa the mitochondrial network alters components involved in excitotoxicity and this vicious cycle likely contributes to disease pathology in DOA. Opa1 mutant mice resemble the human disease phenotype [22, 38]. They also show reduced levels of the mitochondrial superoxide dismutase SOD2, which disposes toxic superoxide into hydrogen peroxide and oxygen . Increased ROS has been found in OPA1 mutant worms and flies [80–82], and OPA1 seems to alter mitochondrial respiration in patients with DOA [83, 84]. The integration of mitochondrial respiration and reactive oxygen species (ROS) into the regulation of mitochondrial fission and fusion, however, is still not fully resolved. Noteworthy in this context is that OPA1L processing is inhibited by Higd-1a and silencing of Higd-1a results in growth retardation, cristae disorganization and loss of mtDNA . Loss of mtDNA was also described in patients with non-syndromic DOA  and in patients with syndromic DOA, where loss of mtDNA caused cytochrome C oxidase deficiency . OPA1 exon 4b is thought to alter mtDNA replication and distribution . Also mtDNA deletions have been associated with OPA1 mutations in patients with non-syndromic DOA  and syndromic DOA [30, 31]. Conditional MFN1 and MFN2 double knock-out mice also accumulate mtDNA deletions and show severe mtDNA depletion . However, other studies challenge a direct link of OPA1 and mtDNA deletions [88, 89]. Particularly patients with severe course of disease revealed no changes in mtDNA, for example one patient carrying an OPA1 mutation and diagnosed with Behr syndrome , as well as the two children that carry compound heterozygous OPA1 mutations . Data on the three Opa1 mouse models are consistent with these findings because optic nerve dysfunction and extra-ocular impairments in these models are not linked with mtDNA deletions or mtDNA depletion either [32, 91, 92]. To conclude, loss of mtDNA or mtDNA deletions can account for some but not all of the phenotypes associated with OPA1 mutations. Although tissue specific compensation of mtDNA alterations might be an explanation , mtDNA deletions and mtDNA depletion could as well be the consequence of impaired MQC rather than the primary cause of the disease. Recently OPA1 was found associated to lipid droplets of murine adipocytes and this study demonstrated that silencing of OPA1 affects the adrenergic regulation of the lipolysis . In this context it is noteworthy that 20-month old Opa1 mutant mice showed no signs of obesity under regular animal housing conditions, while all animals in the control group were morbidly obese at this age . Cardiac mitochondria of Opa1 mutant mice are also less able to oxidize lipids compared to mitochondria of control mice . Mice lacking the protease Oma1, which has an inhibitory effect on OPA1 by processing OPA1L at S1, are obese and show decreased fatty-acid β-oxidation compared to controls . These findings imply that OPA1 is also directly involved in the integration of the cellular metabolic state into the mitochondrial network and it is well established that mitochondrial network morphology changes to adapt oxidative phosphorylation to the metabolic state of the cell . In accordance to this are the alterations of oxidative phosphorylation observed in patients with DOA and OPA1-silenced cells [60, 86]. Still, the knowledge on the molecular basis for the integration of mitochondrial or cellular parameters other than ΔΨm in MQC is still vague and this topic deserves more exploration. Mitochondrial fission and fusion occupies a central position in MQC and it processes different intracellular and extracellular parameters in order to accommodate cell homeostasis and cell fate by the following measures: a) Mitochondrial network morphology changes to either a more filamentous or more fragmented state to adapt mitochondrial function to actual energetic and metabolic demands of the host cell. b) Fusion of dysfunctional mitochondria to functional mitochondria can attenuate damage to mitochondrial proteins, lipids, and mtDNA. c) Inhibition of mitochondrial fusion targets single dysfunctional mitochondria to the mitochondrial autophagy pathway. d) Mitochondrial fragmentation, mitochondrial outer membrane permeabilization, and cytochrome C release signals severely impaired host cells to undergo cell death. According to this, mitochondrial fusion maintains mitochondria by attenuating mitochondrial damage as well as by protecting from mitochondrial autophagy. Moreover mitochondrial fusion antagonizes cell death signaling. That is why reducing the ability of mitochondria to fuse – as implied by mutations in OPA1 or deletion of one OPA1 allele – compromises MQC in a way that cells are more prone to intracellular and extracellular stress factors. Interestingly this means that dominant-negative OPA1 mutations can lead to the removal of the protein coded by this dominant-negative OPA1 allele by boosting mitochondrial autophagy. This can phenocopy haploinsufficiency, since mutant protein would not be detectable unless one interferes pharmacologically with MQC. Additionally, dominant-negative OPA1 mutations can involve also higher mitochondrial turnover rates as amplified mitochondrial biogenesis may balance higher mitochondrial autophagy rates. 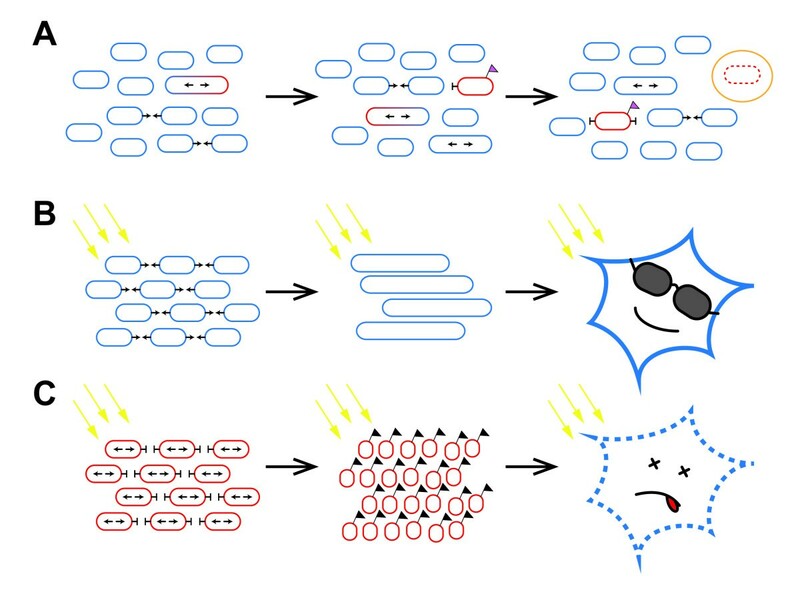 Impairments in MQC affect different cell types in different individuals in a different way depending on the individual’s unique profile of intracellular and extracellular stress factors. In other words, the heterogeneous clinical presentation of patients with DOA is caused by the individual’s unique profile of genetic and environmental risk factors. Then one can ask which risk factors do harm RGCs more than other cell types? These risk factors are possibly the same that lead to RGC death in glaucoma and genetic and environmental risk factors that trigger glaucoma are reviewed in numerous publications and are beyond the scope of this article. And yet, also OPA1 polymorphisms are discussed to be associated with certain forms of glaucoma . In this context, it is of particular interest that glaucomatous insults trigger OPA1 cleavage, mitochondrial fission, and mitochondrial autophagy in RGC axons of the optic nerve head in a mouse model of glaucoma . To sum up, OPA1 mutations impair MQC, which is more mitochondrial ontology than quality control, thereby rendering cells more susceptible to stress factors. In particular RGCs are under risk but all other cell types can be affected, too. Looking at glaucoma, there seems to be a unique risk profile for RGCs, which is also applicable to DOA. This brings together DOA and glaucoma. We are deeply indebted to Daniel Ju (UCSD) for critical reading of the manuscript. We also appreciate very helpful and valuable comments from anonymous reviewers. MVA and NF jointly developed ideas and wrote the manuscript. MVA prepared the figures. Both authors read and approved the final manuscript.